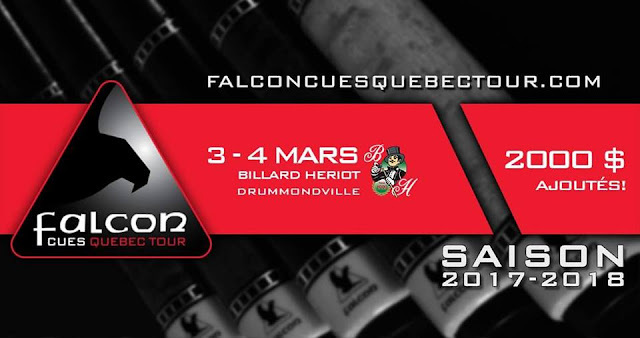 Canadian News : Falcon Tour In Drummondville This Weekend! Billiard Heriot in Drummondville Québec located about an hour outside of Montreal on route to Quebec City, will host a Falcon Tour stop this weekend. A few weeks back Dooly's Neufchatel hosted the most recent stop and 47 players came to participate, this tied Terminus in Gatineau for the second highest number of players this season. With this pool hall being located between Montreal and Québec City were most of the elite players AAA and above live, this has the potential to be another record turnout. The field in Neufchatel featured 12 Pro's, and many other top players. The Falcon Tour now in its 3rd season has seen professional participation increase a fair bit as well as seeing a lot of players in the AAA and Semi-Pro range come out of long hibernation now that there is an elite circuit to play on. Dooly's Neufchatel is a beautiful venue with a great staff. Marco Sanchargrin a well known promoter in the province is the owner and for a chain it really feels like a mom and pop place that caters to the players. In the Finals it was a couple familiar foes facing off as Alain Martel and Danny Hewitt. In the winners side final they also met, with Danny Hewitt winning 9-5. In the third place match Martel played Joey Cicero who has been close a few times to winning his first Falcon Tour stop. He already had a finals appearance at La Patriote in December and a few other top finishes. However the seasoned "Dancing Bear" was once again too much for the young upstart Cicero as he fell 9-4. In the final Martel revenged his earlier loss to Hewitt 11-8 to win his third event of the season. I am accepting sponsorship as always to help cover expenses to go and cover the event this weekend. It is a great and cheap way to advertise your business as no contribution is to small. Also if you are a frequent reader of Cue Sport Nation it is a great way to support us and to make sure the updates keep on coming. Email transfer and receipts are available! Hope to see many new faces this weekend! Once again I would like the thank my main sponsor for this event, Rack-M-Up Billiards in Cornwall Ontario!